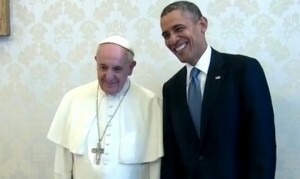 ROME — Barack Obama visited the Vatican on Thursday, sitting down for the first time with Pope Francis, the leader of the Roman Catholic religion. Obama was joined by Secretary of State John Kerry and National Security Adviser Susan Rice, among other aides who accompanied him for the trip. According to reports, the two discussed matters such as income inequality, immigration reform, human trafficking, the conflict in Syria, the persecution of Christians worldwide and the desire for global peace. Subjects such as homosexuality and abortion were largely skirted during the meeting, although Vatican Secretary of State, Cardinal Pietro Parolin is stated to have cited concerns about Obama’s health care plan and Catholic objections to covering abortifacients. “I pledged to continue to dialogue with the U.S. Conference of [Catholic] Bishops to make sure that we can strike the right balance,” Obama told reporters. Obama and Pope Francis exchanged gifts during the visit, as Obama gave the pope a seed chest that contained fruit and vegetable seeds that are used in the White House garden. The chest is said to be made out of reclaimed wood from the Basilica of the National Shrine of the Assumption of the Blessed Virgin Mary in Maryland, one of the oldest Catholic institutions in America. The pope gifted Obama with two medallions, along with a copy of his book The Joy of the Gospel, which centers on Catholic missionary work and assisting the poor. As previously reported, Pope Francis has welcomed a variety of world leaders to the Vatican over the past year, including Ekmeleddin Ihsanoglu, the secretary general of the Organization of Islamic Cooperation (OIC). The pope also held an ecumenical meeting last spring, greeting Christian, Muslim and Jewish leaders, as well as those who ascribe to no faith at all. “For my part, I wish to assure you, following in the path of my predecessors, of my firm will to continue on the path of ecumenical dialogue,” he said, referencing the Second Vatican Council. Many have also remarked that, while not changing the Vatican’s position on homosexuality and abortion, Pope Francis has given the Roman Catholic Church a more conciliatory tone in regard to addressing prominent moral issues.